Despite the need for it people in some law firms still pay only lip service to the needs of marketing. The protection and development of clients is a science as is the generation of new business. Last month I identified the potential in the establishment of informal referral networks. Today we look at a relatively new force that will be disregarded at your peril. Image, branding, networking, relationships and referrals need to be supported with the use of the web. Increasingly both private and commercial clients are using the web as a way of identifying and making first contact with solicitors. For the 14 million members of the "Y" generation (16 - 34 year old) the web is the first reference point to identify shortlists and then everything else such as brand and reputation kicks in. For other age groups this facility is increasing in its use. I research myself that way and before meeting law firm clients or speaking to groups about marketing I always test the web sites of firms and the search engine optimisation that they employ. Commercial organisations as well as private clients are in this assessment. The view of many most corporate lawyers is that they need a website, but only as something that their clients and prospects can look at to get a view of their worthiness. Increasingly SMEs will use the web to find a potential regional law provider. I heard last week of one Manchester law firm that was appointed in the disposal of a private company as a result of being contacted through the web. In total this contract will generate around £25,000 in fees. Evidence that a website can have an impact in all areas of a legal practice. The web is becoming a core part of everyones's life and a central information resource. 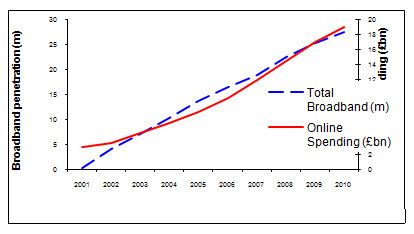 This graph shows the adoption of broadband in the UK and demonstrates that growth in internet spending is expected strong and inline with broadband penetration. Impressive but the rate at which the internet is being used as a method of making initial contact with a later offline transaction is thought to be even higher. A good presence on the internet is a must for any law practice wanting to be successful in the future. There are many potential organizations that can assist in web development as part of the firms marketing strategy. I consulted with one of my contacts at I-COM, a Manchester based specialist legal web design and marketing agency, to identify some tips for copy to be used on a website for enhanced revenue generation. Focus on the benefits working with your firm brings rather than just factual information A potential client might be interested in the fact that your practice was established in 1850 and has been based in the same offices ever since. A potential client will be much more interested and more likely to do business with you if you make it clear what you can do to help them. Never ever copy the text from someone else's website to use on yours. Content should be unique to your business and structured to communicate your particular message to prospective clients. Copied content can be recognised by Google and a potential client may penalise you for it. Include the keywords you think people will want to use in search engines. It's amazing how many law firms have an aversion to using the word "solicitors" or "lawyers" on their websites preferring to use softer phrases like our "team of conveyancing specialists". Clients are not that subtle, they'll type "conveyancing solicitors" into Google and unless you include the word "solicitors" you will not be found. Don't forget to tell people to contact you. It's amazing how many sites don't tell or invite potential clients to get in touch. Internet users are lazy and do not want to have to look too hard for information. So make it easy for them! Finish every page with a 'call to action' statement - including the phone number and link to the 'contact' page. Follow these rules and your site should become more effective once people land on it. We shall look at how to get them there at a later date. Question those with marketing responsibility in the firm on how web site is designed to help retain and develop clients and identify new ones. Make sure that activity around your web site supports your marketing plan. A good place to start might be to take a look at I-COM's site and blog at www.i-com.net. Bill Kirby is Managing Director of Professional Choice Consultancy and Director of Managed Services Consultancy. PCC advises law firms on business strategy and planning and the effective use of IT.